15 Things To Do In Rishikesh – For The Love of YOGA and all things nice! Located in the foothills of the Himalayas beside the holy Ganges River, in India’s northern state of Uttarakhand, Rishikesh is world’s capital of yoga and meditation. The city has an infinite number of temples and ashrams, in the traffic-free, alcohol free and vegetarian part of town and continues to attract more and more worldwide visitors. I feel a special connection with Rishikesh for it was my first stop in India last year. This is where my spiritual journey started and also the place where I met Prachi. After having spent over 4 months there, staying in ashrams, doing yoga courses, replenishing my body and mind with great food and entertainment, I feel like sharing my experience. Below are 15 things to do in Rishikesh. Located by the banks of The Ganga, Parmarth Niketan Ashram is definitely a must see in Rishikesh. With over 1,000 rooms, Parmarth Niketan is the largest ashram in Rishikesh, providing accommodation to a wide range of visitors, ranging from casual yoga practitioner to devoted spiritual seekers. One of the main activity at the ashram is the world reknown and very special daily Ganga arti (fire ceremony) at sunset which will leave you breathless; not to be missed! Looking for some real physically challenging yoga in Rishikesh? Try Tattvaa Yoga Shala studio which is the only studio in Rishikesh situated directly on the banks of the Ganges River by Ram Jhula. The place holds daily open classes in Vinyassa style for all levels as well as various intensive yoga courses throughout the year. The views of the Ganges River from the hall inspire devotion to the practice. After classes, take the 10 steps down to contemplate around the clear running river. The Sivananda Ashram in Rishikesh is a place for those interested in the serious practice of yoga. The place holds daily classes in traditional Hatha yoga and spirituality followings the teachings of one of the most world reknown yogi Swami Sivananda. The beautiful, pure and serene atmosphere of the Ashram makes it an ideal place for spiritual practice. For authentic and really tasteful North Indian food, nothing beats the canteen at Vanprastha ashram. Food is cooked with love, mixed with the right amount of spices, and served quickly; and the best part is, it’s real cheap! Amazing parathas and poha. Highly recommended! Located behind Parmarth Niketan ashram. Located in Ram Jhula near Gita Bhavan, the Juice shop can hardly be missed. Serving beautiful fresh juices and huge fruit salads, the place is a famous spot to socialise with a highly diverse crowd. Vegan breakfast is our ultimate favourite. You won’t be disappointed! Nothing better than a ‘sweet lassi’ to cool down your body and mind especially in the summer heat. And of all the places in Rishikesh, Pappu Lassi in Rishikesh Town is The place for that. So creamy, so delicious; Try it, you’ll see! Apart from spirituality, one of the great advantages of having Tibetans in India is the delicious momos! Whether steamed or fried, these Tibetan dumplings will make you ask for more. Best enjoyed at Momo centre- a small and friendly stall located in Lakshman Jhula. Sanskriti cafe is made for those looking for food with an extra touch of service, style and elegance. they serve delicious organic food. Overseeing the Ganges River, the place blends discreetly with the holistic natural surroundings to enhance the serenity. Apart from the cafe the place works as a premium retreat centre which offers Ayuverda treatments and yoga & meditation classes. Located adjacent to the Sivananda Ashram close to the crossing of Ram Jhula. Ramana’s Organic Cafe is one of the most charming place I have ever been in. It is part of an orphanage and is run by the orphanage staff and kids during the peak season. All vegetables come from nearby organic farms, the food is cooked with dedication and is simply the most delicious I’ve had in Rishikesh. All the profits go to the orphanage to help children with their future. It doesn’t get any better than that! Apart from Ramana’s cafe, Healthy yogi is another hotspot for those looking for super healthy & nutritious meals. We only discovered it recently, but during our last trip, we ended up there everyday! Perfect food for serious yogis. Rafting down the Ganges River is an activity that you just can’t escape when you come to Rishikesh. It is such a beautiful ride and jumping into the river will cool you down! Places for rafting are available everywhere. In February 1968, The Beatles travelled to Rishikesh, to attend an advanced Transcendental Meditation training session at Maharishi Mahesh Yogi Ashram. 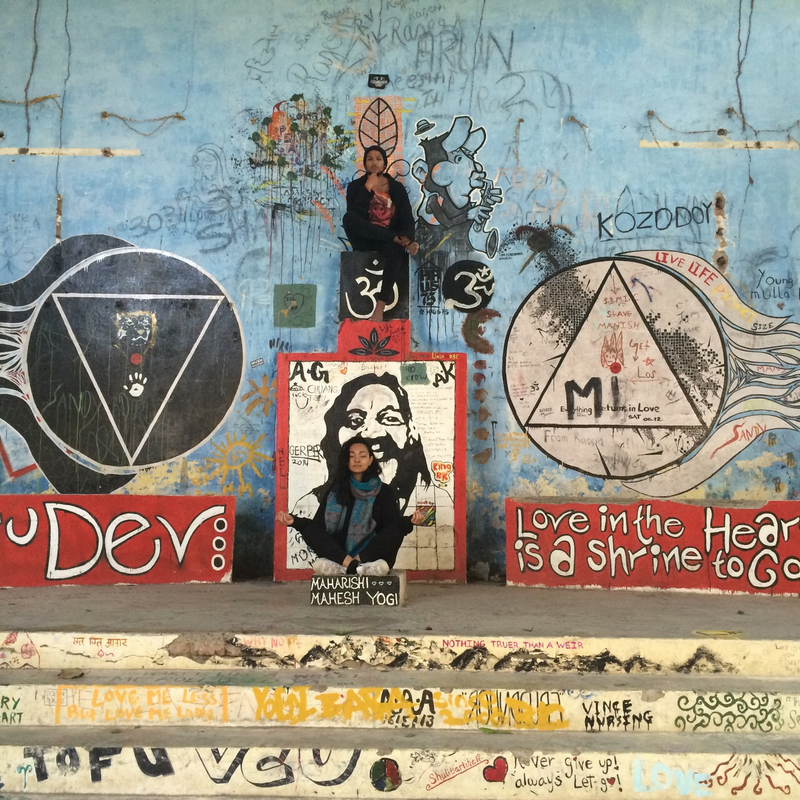 The ashram was a great place of inspiration for the band who managed to write some 48 songs! Although the place doesn’t work as an ashram anymore and is mainly ruins, it remains open for people to visit and get inspired by its unique vibe. This temple is situated at a height of 1330 meters and is located about 32 km from Rishikesh. According to Hindu mythology, the place where the Neelkanth Mahadev Temple currently stands is the sacred location where Lord Shiva consumed the poison that originated from the sea when Devas (Gods) and Asuras(Demons) churned the ocean in order to obtain Amrita. The drive to the temple is picturesque and is best enjoyed on a bike. A must visit, if not for the temple then just for the uphill drive! One of the most exciting activity that one can look forward to during their travel to Rishikesh is trekking to the numerous hidden waterfalls. These waterfalls are hidden in jungles and very well preserved by nature. The Neergadh Waterfall is one of the most frequented as it is the easiest to access. There is also a small pool where one can bathe. There are more waterfalls located on the neelkanth mandir road and these are our favourite. To reach here, you need to walk through the forests and the seclusion of these waterfalls adds to their charm. The water is clean and fresh and because people hardly go there, they make for a great bathing place and enjoying the day in peace and quiet away from the bustling town. Whether or not you believe in the power of the holiest river on the planet doesn’t matter, when you come to Rishikesh you should definitely take a dip in the Ganges. People advised me not to back home at the time but I did it anyway and I loved it! If you feel like we’ve missed out on anything, do share with us in the comments below.